On February 23, 2017, the Plumbing Museum will premiere the work of Ryan Leitner, an inaugural artist and participant in the Manoog Family Artist-in-Residency program, the museum announced. Leitner’s two-month long exhibition in the museum will showcase a series of artworks created during his three-month residency in Watertown as part of the new program launched last fall in partnership with J.C. Cannistraro. 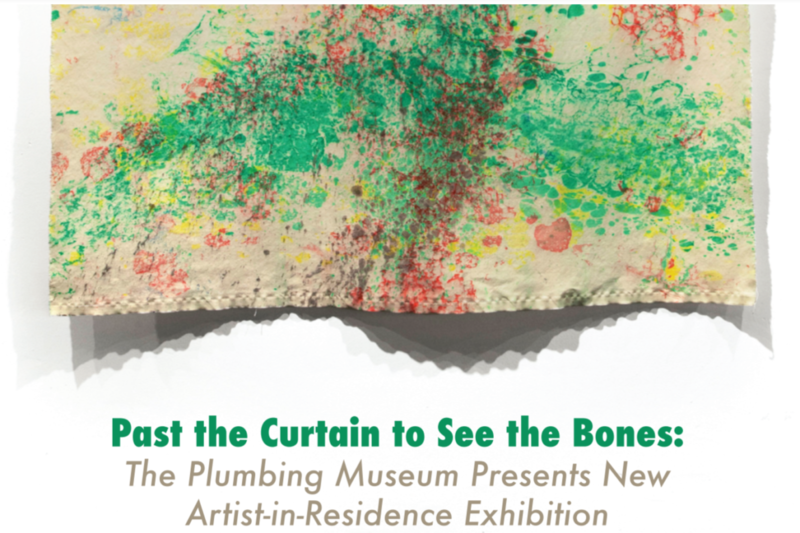 Entitled Past the Curtain to See the Bones, Leitner’s exhibition will explore the architecture and archive of the Plumbing Museum through his signature style of painting and sculpture. Leading up to his residency, Leitner’s work has explored the act of traveling thorough a confined space. “I got tired of looking outside of the box for new material, so I dug deeper within it” explains Leitner. This can be viewed in one of his previous video pieces where he explores his studio with a microscopic camera, creating a new world view within its space. His site specific installations also explore the spaces they inhabit, usually by taking visual cues from its surroundings space and incorporating the two. The Manoog Family Artist-in-Residency is a space for creative exploration of art and technology. “We wanted to create a space where emerging artists could produce an original body of work in an industrial setting” said Sasha Parfenova, Museum Program Coordinator. “As an artist myself, I know how challenging it can be to create work in the confines of your own studio. The local community can look forward to bold and exciting new work coming out of this residency program as all of the participating artists will have an exhibition each season. The first of these events will take place at the Plumbing Museum on February 23, 2017 from 5:30-7:30 p.m. All are welcomed to attend. Located in a renovated ice house in Watertown, MA, the American Sanitary Plumbing Museum is dedicated to promoting the contributions of the plumbing industry and its talented craftsmen across the United States. Through its unique mix of industrial history and modern art, it showcases artifacts and exhibits that range from 19th century tubs to modern toilets and a functioning rainwater reclamation system. The museum welcomes nearly a thousand visitors each year for tours and private events, and has been featured in the Wall Street Journal. For more information, visit: www.theplumbingmuseum.org.